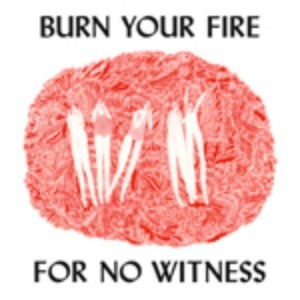 Following up a debut as strong as Angel Olsen’s Half Way Home is no small order, and Burn Your Fire For No Witness ups the ante considerably, dialing back the Roy Orbison-isms and bringing in a full band. The curious beauty of her voice is still present, but in service to the tunes, and what a batch it is. Aided by a winningly subtle John Congleton production, it’s a collection of reverb-drenched indie torch songs that alternately rock, (“Forgiven/Forgotten”, “Hi Five”), or smolder, (“High and Wild”, “Lights Out”). When she slips in a ballad, (“Enemy”), even the songs pitched just above a whisper carry a chem trail of menace. The sequencing ensures a rollercoaster ride, from the harrowing emotional trench warfare of “White Fire”, which spawned the line that became the album title, to the liberation of standout track “Stars”, that captures a taste of ‘Berlin-era’ Bowie. While willfully elliptical lyrically, pearls abound. The word limit could have been used on “White Fire” alone, but ultimately, the take away is the hard won wisdom of “Enemy”: “”I’m lighter on my feet when I’ve left some things behind.” “Windows” closes out the journey, serving as a summation of all that came before.